Adalay and I took an evening break and headed for the Detroit Zoo for an adults only event. 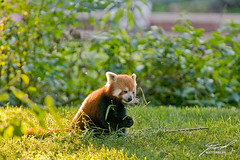 It's rare that we're able to see the Red Panda, but this evening one of them was up and wandering around the exhibit. They're so cute.